Limited first pressing on red and white vinyl! 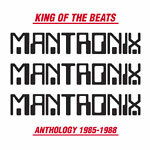 Kurtis Mantronik and MC Tee formed the group Mantronix In the early 80s. Their Sleeping Bag Records debut, ''Mantronix: The Album,'' shot to commercial success on the strength of their debut single, ''Fresh Is The Word''. The influence of this groundbreaking debut is still felt in popular music today, having been sampled by the likes of Beastie Boys, Beck, The Prodigy and more. Kurtis Mantronik was also as dangerous behind the desk as he was behind the boards. Working as A&R for Sleeping Bag while signed to the label, Mantronik also helped recruit, sign, and produce for artists such as T La Rock and Just-Ice. Notable records from this era include, Just Ice's ''Cold Gettin' Dumb'' and ''Back to the Old School'' as well as T La Rock's ''Breaking Bells (12'' Version)''. Now available for the first time ever, Traffic Entertainment Group in conjunction with Sleeping Bag Records and Warlock Entertainment present; Mantronix: King of the Beats, The Anthology 1985-1988. This carefully curated double LP compilation combines the best of Mantronix's work from the early, and arguably, best era of their career into one amazing listening experience. Whether you are an avid Mantronix fan or are looking for a place to start, this is the collection to wrap your ears around.